As much as we would love everyone to floss every single day, we are realistic and understand that some people can’t or, won’t floss…ever. Circumstances such as larger spaces in between the teeth, a small mouth, large hands, arthritis, or specific dental restorations can make it difficult to maneuver floss for effective oral hygiene. Did you know that if you are only brushing, you’re only cleaning 60% of your teeth? •Waterpik: delivers a stream of water to stimulate the gum tissue and flush out food particles between the teeth, around crowns, and around orthodontic appliances. •Air Flosser: similar to a waterpik, it gently delivers a microburst of air and water to clean between the teeth in less than one minute. •Soft Picks: shaped like tiny Christmas trees, these rubber picks gently fit between the teeth in tight spaces where other picks and oral hygiene aids can’t. •Proxabrushes: these small picks look like mini pipe cleaners and work great in bigger spaces, food traps, and areas where floss isn’t as efficient. Please note: Nothing replaces or is as effective as string floss. However, any of these methods are helpful in keeping your mouth more healthy, despite lack of flossing. 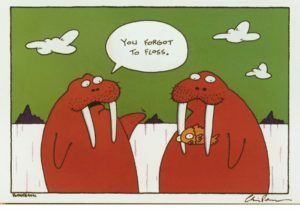 If you have any questions for Northfield Family Dental, your Denver family dentists of choice, regarding your oral hygiene please contact us at 720-778-0400. Thank you and have a great day! ← Is Flouride Right For You?